When doe ond cut back the leaves of calla lilies after they have bloomed for the season. Can it be done as soon as the bloom period is over or do I need to wait for the leaves to yellow and dry back? 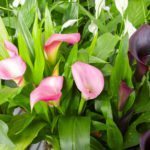 Calla lilies have beautiful foliage, even when the plants are not in bloom. If the foliage still is green and healthy looking, let it grow as it is adding interest to the garden. Once it begins its decline, or after a killing frost, cut the old foliage off.